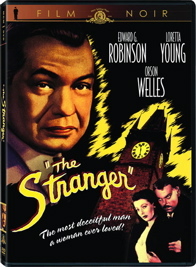 MGM reaches into its United Artists vault and comes up with Orson Welles' 1946 The Stranger, which was originally released by RKO. Sort of a 'post-mature' anti-Fascist movie, Anthony Veiller's screenplay emphasizes the persistence of Nazis after the defeat of Germany. Pictures like Cornered and even Gilda referred to ex-Nazis reforming a possible new Reich in Latin America; in just a year that threat would be abandoned as the U.S.A. geared its propaganda machine to oppose the Communist threat posed by Russia, and eventually Red China. Although rumors abounded of high-ranking Nazis recruited for new American intelligence agencies, anti-Fascist movies started to disappear. In 1950, a finished RKO film called The Man He Found was partially re-shot to turn an evil Nazi conspiracy into an evil Commie conspiracy. Hitler was out, Ivan was in. The movie was re-titled The Whip Hand. Orson Welles reportedly took on The Stranger to prove that he could make a popular thriller without production complications, to show Hollywood that he was neither difficult to work with nor an irresponsible spendthrift. The film was a financial success, and some say the only Welles picture to turn a profit. The efficient story is about the cornering of a Nazi monster, not somewhere in Europe or South America, but in an idyllic American college town. Nazi mass-murder architect Franz Kindler is unaccounted for, and U.S. special agent "Mr. Wilson" (Edward G. Robinson) frees an imprisoned underling, Konrad Meinike (Konstantin Shayne) in hopes that he can be followed to his former superior. The trail leads through Latin America and then to Harper, Connecticut, where Meineke suddenly disappears. Wilson suspects new citizen Professor Charles Rankin (Orson Welles) until Rankin makes an anti-Fascist speech over the table at a dinner party. But Rankin's new wife Mary (Loretta Young) seems upset when first her dog and Meineke turn up dead. Rankin soothes Mary with talk of blackmail trouble. Wilson must get her to accept the fact that her husband is not a romantic with problems, but a dangerous escaped war criminal. The Stranger is an efficient and impressive production handsomely directed by Welles for maximum suspense. He's also quite good as the lead villain, building Charles Rankin / Franz Kindler as complex character with several levels of secrets to hide. It's a gripping thriller, especially for 1946, and builds to an audience-pleasing comeuppance conclusion that doesn't overdo some bizarre dramatic effects. According to a fascinating article that appeared several years ago in Video Watchdog, Welles originally intended The Stranger to have a much longer prologue depicting a trail of intrigue and murders as the sinister Konrad Meineke makes his way to America. Perhaps intended to sell the idea that South American 'good neighbors' were also intent on capturing fugitive Nazis, the prologue isn't really missed. The existing cut gets us to Connecticut in the first reel, establishing that Robinson's dogged secret agent is intent on catching his quarry. The script divides its time between three locations. At the old-fashioned cracker-barrel general store, Billy House's Mr. Potter plays checkers, keeps tabs on all who come and go and in general refuses to move unless absolutely necessary. The New Englanders are scrupulously honest and proud of it. Potter won't open Meineke's abandoned suitcase without a witness, and at one point Mary tells us that she's perfectly safe walking home in the dark because, "This is Harper." Mary's father's house represents good Liberal America (Rankin uses those words) as Mary's father is an ex- Supreme Court Justice. Wilson finds a friend and early ally in Mary's brother Noah (Richard Long), as they link Meineke's fate to the slippery Rankin. Rankin is capable of strangling a man, poisoning a dog and, when she becomes a liability, setting his own wife up for an accidental fall. Welles reserves his baroque touches for a tall church tower with a strangely European-gothic clock, the kind with animated figures. For Rankin / Kindler, bringing the broken clock back to life might represent getting the gears of the Nazi mechanism working in this new, unsuspecting country. The clock tower becomes the stage for risky confrontations and Kindler's last stand. Welles works with a small and economical cast, finding a bit for his old Mercury Theater actor Erskine Sanford at a dinner party. Russell Metty's camerawork is sharp and unfussy. The original story is by Victor Trivas, a German who would return to his home country to later make the rare surgical horror film Die nackte und der satan (The Head). MGM's disc of The Stranger is an excellent transfer from original elements from the UA vault, and will make redundant the many faded public domain copies available. Unfortunately, the original ending optical has been over-cut with a crude The End card that interrupts a final shot of Edward G. Robinson. It's not a Television reformatting but a reissue job done right to the original elements. The full prologue was shot and reportedly edited, but if it and any variant versions of the film survived, they no longer exist at MGM. In 1989, 'economizing' MGM-Pathé executives junked an entire vault of incidental, saved UA film elements. Unlike Fox and Warners, MGM is dropping its film noir gems on the market without extras, making them less attractive to the very fans likely to be interested in old B&W thrillers. That's a shame, because The Stranger has a fascinating production story and a historically significant theme.